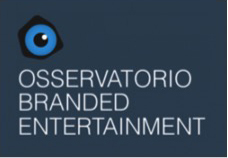 Observatory of Branded Entertainment is an initiative that is aimed at national and multinational companies operating in Italy which produce, distribute or commission, directly or indirectly, projects of branded entertainment. OBE’s aim is to study the phenomenon and propose optimal solutions to the problems of enterprises that use this lever of communication, eg. effectiveness analysis or dissemination of know-how. Of international scope, the Observatory aims to be the reference point for all stakeholders in the chain: who commissioned – investors, national and international companies; those who produce (creative agencies, media companies), those planning (media centers, dealerships), who rule (institutions), who informs (the press, universities, associations, national and international).